Welcome to the first installment of my new series: Vegan on Etsy! I want to include more of the “lifestyle” in this here “food and lifestyle blog,” and what better way than highlighting the independent makers of Etsy? It’s my go-to source when I’m in the market for any new good; even if I ultimately purchase something elsewhere, Etsy is a crucial part of my research. As part of my drive towards minimalism and to do my small part to combat the overabundance of cheaply, unethically made goods, I try to make purchases with intention. I’m not perfect, but I’m trying — and I’d like to help you try, too. In this series, I’ll focus on different purchases one could make on Etsy, and I’ll call out cruelty-free, vegan options that catch my eye. Up first: bags! purses! Or as my Grammy would say, pocketbooks. For cruelty-free, sustainably made handbags, wallets, and accessories, Matt and Nat is rightfully popular in the world of vegan shopping. But there are other options, especially on Etsy. (Which is not to knock Matt and Nat — I have two bags and an iPad case from them that I love and use regularly.) Recently, I was in the market for a cross-body, travel-friendly, not-super-fancy-but-also-smart-looking satchel-type bag I could use while traveling but also for work, if necessary. A tall order? You betcha. But Etsy came through. I’ll share my choice at the end of this post, but first I’d like to highlight some of the other cruelty-free bags I found during my research. I reached out to the owners of these shops and they all graciously chatted about their businesses and why they’ve chosen to offer only cruelty-free goods. First, a note about prices: you are unlikely to find uber-cheap goods on Etsy, and if you do, you ought to question whether they’re truly made independently. The vast majority of Etsy’s makers are small independent creatives who really love what they do, and they do it well. You get what you pay for, and quality isn’t cheap. As I’m moving towards a smaller, more intentional and long-lasting wardrobe, I’m becoming okay with paying a little more for something that will last longer and be a true staple. Your mileage may vary! If you’re into a utilitarian yet wholly unique aesthetic, Badimyon is a great place to start, with bags made of leftover materials from the upholstery and home décor industries. Badimyon means “inside your imagination” in Hebrew, and the husband and wife team who run it live in an intentional community in Hakuk, Israel. “The community now includes 50 families who share similar values of self-sustainability, sharing and ecology,” founder Elad says. With a school system for the kids, yoga classes, and discussion circles, it sounds like a heavenly place to live — and to be creative. The founders strive to offer high-quality, limited-edition products, and their current line features everything from wallets up to roomy hobo bags in a variety of fabric and prints. I particularly like the neutrals; they’re a great unisex option. My favorite product is this canvas backpack. I love the sleek shape and style and that it’s large enough to fit a laptop without looking bulky. 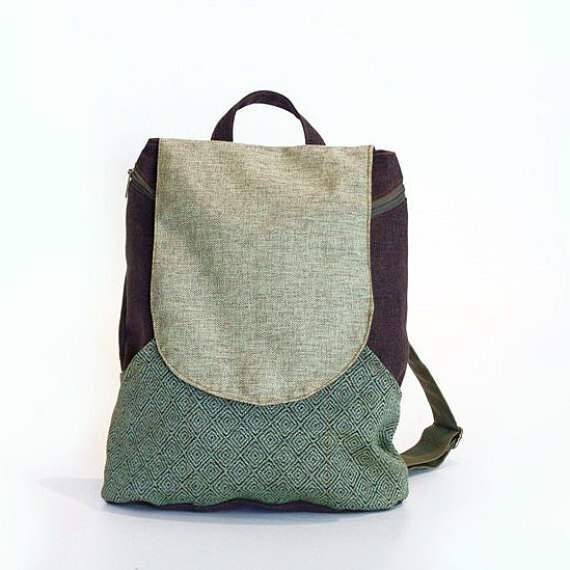 Plus, Badimyon gives you the option to create a customized backpack by letting you mix and match fabrics. The pricing here is about average for bags of this sort, and shipping from Israel to the US will be about $13. Despite its name, Beg for a Bag won’t leave you begging for options! Alongside typical options like messenger bags and backpacks, they also offer yoga mat bags, diaper bags, and even a doggie harness. Most items feature muted neutrals, although there are a few fun prints for the diaper bags. 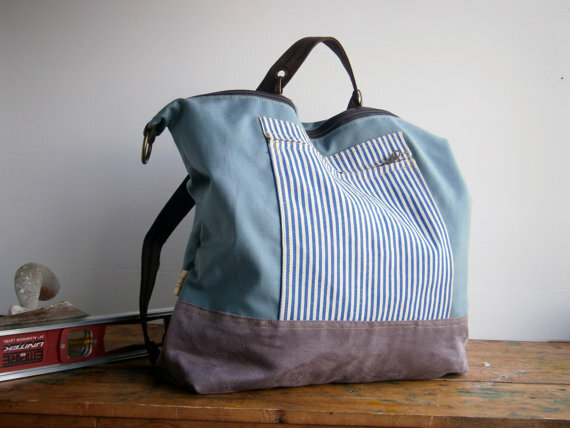 The Shay tote caught my eye as an ideal travel bag. With lots of pockets and a zippered top, it’s roomy enough to stash all your essentials (including a laptop!) while still offering security. Beg for a Bag’s prices skew a little higher than its competitors’, as does its shipping — about $15 to the US. Custom-made in a small workshop in Poland, Cocoono’s offerings are inspired by nature — their designs are available in cool beiges, greys, and taupes. I appreciate that they stick to about six styles and offer variations on those styles by updating the colors and patterns; it’s nice to see confident makers who do what they do and do it well. Cocoono just launched a limited-edition line for 2016 which features cruelty-free faux wool. It’s a really neat look! I’m so intrigued by this Mega Shopper Bag! Most of my reusable shopping bags are anything but stylish, and that’s fine for groceries. But I admit to feeling a little strange on the few occasions when I buy clothes in a store and ask the cashier to put them in a Trader Joe’s bag! 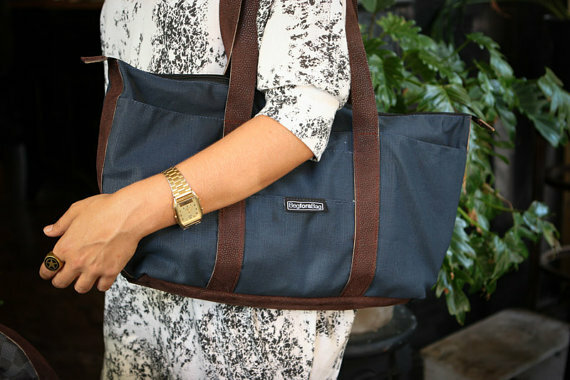 This tote would be great to take shopping; it even has smaller internal pockets for your wallet and phone. The bags in this shop are all priced very reasonably for styles of their ilk, and shipping is typically about $12 from Poland to the US. Based in Ukraine, July and Alex of Good Mood Moon are self-professed vegans and animal lovers. They create gorgeous faux-leather bags, belts, bracelets, and more. With a dizzying array of colors on offer, there’s something to fit everybody’s taste. They cater more towards style than pure functionality and are perfect if you want to make a statement with your piece. If you get bored easily, you’ll love the fact that you can switch out the straps on their clutches and a few purses — you can build a whole rainbow of options! I’ve been coveting the Floria bag for a while now, but it’s a little small for an everyday purse for me. Plus, I don’t know whether I could choose a color — there are so many beautiful options! Mint, dark teal, and grey all appeal to me. Good Mood Moon’s prices are quite reasonable for handmade goods, although shipping from Ukraine to the US should run you about $10. I think $30 is a good deal for the Floria bag! Ed. note, 2/24/16: I saw the Floria bag in the wild at a vegan mac and cheese event in Baltimore, and I just had to talk to the owner. She said it fits all her items and she likes it… and I liked the look of it, too! Ed. note, 8/11/16: I bought the Floria bag for myself this summer, in a pretty reddish pink. I really love the material and the overall size, but I do wish it had at least one interior pocket. With unique minimalist designs and colorblock styling, Marten Lab’s bags feature lots of inner pockets — making them both visually appealing AND super functional. They also offer geometric-shaped clutches that would make fantastic statement pieces. When she started this line, vegetarian founder Martina Pretto considered using leather. But she couldn’t do it. “I’d have to force myself in a direction that I’d never feel as “mine”. So I’m always looking for beautiful, durable and cruelty free materials,” Martina told me. And I’m so glad she didn’t. Her gorgeous designs, handmade in Italy, are beautiful options for fashion-forward vegans. In an alternate universe, I live in a small-but-bike-friendly city and bike to work, and I use this bag to carry my laptop. Sigh! These unique and meticulously created pieces are priced accordingly, and note that shipping to the US from Italy is typically around $22. Unlike many of the shops on this list, MeDusa unapologetically offers bright, bold-colored handbags. Although I tend to prefer calmer neutrals, I have quite a few friends who barely own anything black and whose outfits are always bursting with color. From vinyl clutches with embossed patterns to more demure shoulder bags with just a little pizzazz, MeDusa has a little bit of everything — including a panda-inspired cross-body! This sapphire-blue clutch is amazing! I love how it melds a very modern medium (vinyl) with a more traditional lacy design. This is a statement piece if ever I’ve seen one. MeDusa products are easily the most expensive on this list — you’re paying for innovative techniques, after all. Shipping from Israel to the US is remarkably inexpensive, though, at around $7. With laid-back styles and eclectic fabrics, this shop offers casual multi-purpose bags that look especially great for parents. Their signature style is a convertible bag that can function as a backpack, shoulder bag, handbag, or messenger bag. Netta (the shop owner) even has a YouTube video that shows how to use the convertible bag. Netta is a vegan living in Israel, and she describes her business as an adventure: “I am constantly searching and discovering new materials and new sewing techniques, creating high quality products that resemble leather bags and purses, but are 100% vegan. Each bag is unique, and much thought and effort were put to it, from designing to creating. ” Hear, hear! I love this color combo — I could see myself using it as a shoulder bag mostly, but having the option to switch to all those other types would be so helpful. All the bags in this shop are around the $100 range, and shipping is about $12 from Israel to the US. Handmade in small runs in Canada, the bags in this shop are unlike any others on this list. Founder Nadya says it best: “Utilitarian design and eye-catching fabric combinations is what I strive for with each collection.” With geometric angles and the surprising use of large prints on relatively small bags, these designs are fashion-forward and eye-catching. I’m a sucker for diagonal zippers, so I love the look of this tote. And I also love how functional it is, with lots of interior pockets and features to make it easy to grab all your essentials. I always appreciate when a designer thinks through the use cases for her products! 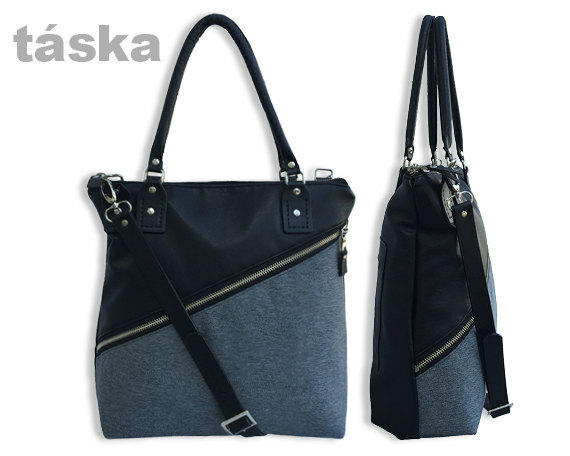 Táska’s bags are on the high end of this list’s price range, and shipping will cost about $11 from Canada to the US. 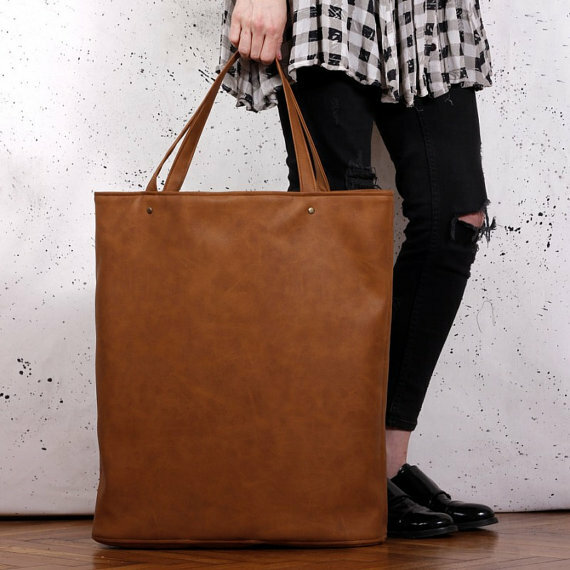 For the classic leather handbag look, Tracce Bags is a great choice. The faux leather bags come in an impressive number of styles, from a demure shoulder bag to a big ol’ tote embellished with gold studs. Most styles are offered in muted tones, but there are some brighter options, particularly in the collection of wallets. 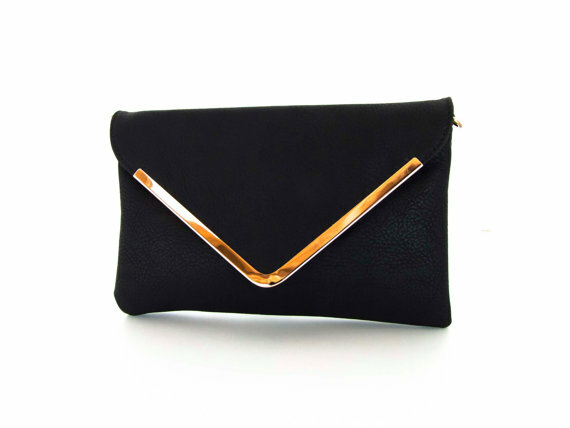 This simple black clutch is just darling! I’ve got quite a few weddings to attend in the next few years (hello, late 20s! ), and this simple yet elegant style looks like just the thing to carry the essentials. Tracce’s prices are on the high end, typical of what you might spend on a similar non-vegan purse, and shipping seems to be a straight $20 within the US. But Paola often offers coupon codes, so be sure to check her shop announcement and shop notes to find a deal. I am a firm believer in voting with my dollar and supporting cruelty-free options from otherwise non-vegan makers. If none of the bags on my previous list quite strike your fancy, maybe you’ll find something here. But if you’re uncomfortable purchasing from folks who use leather, I understand and respect your decision. Spoiler! I ended up purchasing my “cross-body, travel-friendly, not-super-fancy-but-also-smart-looking satchel-type bag I could use while traveling but also for work, if necessary” bag here. My exact bag is no longer available, but it’s similar to this cross-body option. The good folks at Atlas Past confirmed that all the fabric is synthetic — no wool there. I’m very happy with my purchase! The smocked details on these purses are just so fetching! I think this messenger bag would certainly turn heads. With one-of-a-kind bags in a variety of styles and colors, you’ll have to check back often to see if a new design strikes your fancy. The calming color combo on this handbag is just up my alley. Faux leather meets simple, striking patterns in this shop. I particularly like the eye-catching patterns of their cross-body bags. I couldn’t not include this shop, if only because their bags come in happy soy print. Who doesn’t want smiling tofus on their purse?! Sometimes you just need a simple all-purpose bag, and this one would certainly fit the bill. Sinem Inugur offers clean lines, classic designs, and quality construction. The light, airy colors, sweet designs, and nature-inspired prints in this shop are a breath of fresh air. I just adore the look of this purple clutch — that tessellation pattern in gold is killer!